Trapped civilians and rebel deserters are being urged to leave via the four safe escape routes set up by Syria and Russia around the besieged enclave. Rebel attempts to break out have been thwarted by loyalist troops, backed by crack Tiger Force commandos, and Hezbollah and Palestinian militiamen, and supported by Russian and Syrian air strikes. But a Russian transport helicopter was shot down following delivery of humanitarian supplies to Aleppo osia’s Reconciliation Centre in Syria. The Reconciliation Centre, which operates out of the Russian air-base in Syria, oversees local cease-fire agreements and the supply of humanitarian aid across the country. ANTI-fascists and anti-racists were out in force on the streets of London last Friday, with a Black Lives Matter (BLM) protest that started in Oxford Circus and a Unite Against Fascism (UAF) picket in Whitehall, to oppose a march by Islamophobes and neo-fascists in the “South East London Alliance” (SEA), which is one of the splinter groups that formed with the decay of the English Defence League (EDL) and the British National Party (BNP). The 100-strong protest came amidst escalating police racism in Britain and the US. Organisers spoke about the violent arrest of a young black man in London Bridge station last week. 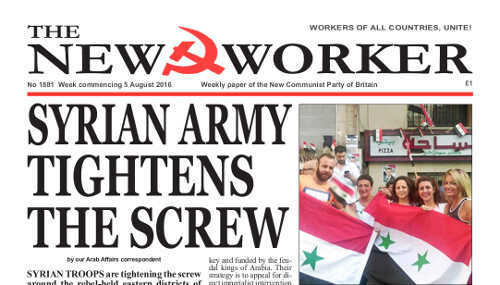 ONE SIDE EFFECT of the huge swing to the left in politics in this country brought about by Jeremy Corbyn winning the Labour Party leadership last year, has been the resurgence of tiny splinter ultra-left groups — Trotskyism, Maoism and other factions. For those of us who are getting on it is a bit like being plunged back into the 1960s — only this time the polemics and critiques are flying about on the social media websites rather than badly produced “Gestetnered” journals. In the ‘60s these groups served to divide and disarm working class solidarity and unity. But there were mistakes on all sides — and if we do not analyse these objectively and honestly there is a danger that they will be repeated.